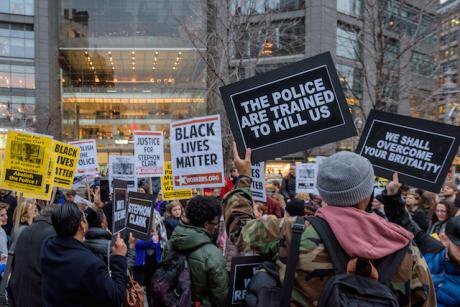 March 28, 2018, New York: protests over the fatal police shooting of Stephon Clark, an unarmed black man in Sacramento, California. Erik McGregor/Press Association. All rights reserved.I started writing this just as the funeral for Stephon Clark was taking place in Sacramento. Clark was the latest in a very long line of unarmed African Americans summarily killed by police in the US. In this case, a black man carrying nothing but a cell phone was shot 20 times in his own garden after police were called out to a reported incident in the area to which Clark had no connection. The banality of standing in your own garden contrasted with the violence of 20 shots – so extreme it tore his body apart, preventing the family from ritually washing it – seems to make this case stand out. But it doesn’t. The Black Lives Matter movement acts as testimony to the countless deaths within the black community and the continuation of the personal and state violence that has been visited upon them since the onset of colonialism and the mass exploitation, torture and murder that was slavery. The funeral of Stephon Clark follows the court decision not to charge the officers that killed Alton Stirling in Baton Rouge in 2016. This fits the pattern in which the killing of black men in particular appears to have no legal consequence. From the perspective of the families these are homicides or murders. From the perspective of political activists these are akin to state executions or assassinations. But the language is important here. Murder assumes some sort of legal redress, while execution suggests some intended legal or institutional support. 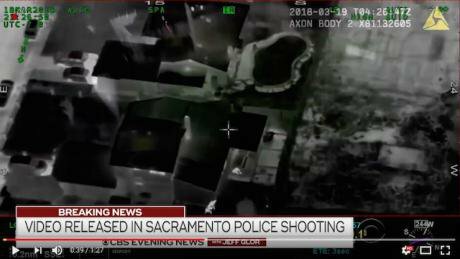 Although I am convinced the US legal system and its police force remain deeply racist and that these killings might be deemed sanctioned executions from that perspective, these events are much closer to the production of what Giorgio Agamben in his book Homo Sacer called “bare life”. This concept refers to what happens in a state of emergency when the sovereign who is seen as the guarantor of the law during peacetime suspends it in response to an external or internal threat. Ordinarily we call this “emergency powers”, defined by the suspension or withdrawal of the usual legal protections. At such times, this suspension of the law allows people to be incarcerated, harmed or killed without any legal redress. Instead of people being protected they are exposed as “bare life” and subjected to violence without any mediation. For Agamben, the ultimate space of this exceptional politics is the concentration camp. From the perspective of the law, “bare life” literally doesn’t matter, which is why the name of the latest black civil rights movement is so pertinent. Since the announcement of the “War on Terror” in September 2001, this exceptional politics or state of emergency has become our normal condition. Not only did the US support the use of torture and use the full force of digital warfare to launch pre-emptive strikes, it also undermined domestic civil rights with far-reaching surveillance legislation under the euphemistically named PATRIOT Act that gave the state unparalleled access to personal data collected through search engines, social media, and mobile phone records. After the catastrophic invasion of Iraq in 2003 in which the entire Iraqi population was treated as “bare life”, and where specific sites of sovereign power like Abu Ghraib became notorious, US foreign policy took a dramatic shift under Obama. Although, the earlier invasion had already been marked by the use of digital technologies, Obama decided that the will of America would be delivered through the drone apparatus; a collection of pilotless armoured planes, human operators, data banks, screens, algorithms, computers and the Internet. Given that the Internet was a military invention, the drone apparatus is the ultimate fantasy in the military desire for decentred, flexible, multi-theater, “casualty-free” warfare. This apparatus – made international through the “Five Eyes” programme – works by using the collection of data from the web, email, digital social networks, as well as locative media and visual surveillance technologies to track down known suspects or detect people deemed to be potential terrorists, or what is termed “pre-insurgent”. Of course, because “pre-insurgency” is epidermally biased it is not hard to imagine how easy it is to become a target if you are brown or black and live in North Africa or the Middle East. These targets that are found by the apparatus itself are fed back into the “kill chain”, a hierarchy of human command that signs off on their killing. In the language of the apparatus, the system produces spaces known as “kill boxes” in which any legal right the target has under International Law as a civilian or under the Geneva Convention as a soldier/warfighter is removed, allowing them to be killed with impunity. Instead of large, static spaces like Guantanamo Bay in which the politics of the exception has been brought to bear on “foreign” bodies, the “kill box” is a micro, momentary, and fleeting space that produces “bare life” and through which contemporary sovereign power operates. Surveillance footage of Stephon Clark’s garden taken from the helicopter called out to assist in the reported incident in which he was an innocent bystander brought to mind the operations of the drone apparatus, and how perfectly – and with a dreadful, terrifying symmetry – the military euphemism of the “kill box” fits with the domestic execution of US sovereign power. Like the state of emergency that underpins its foreign policy, a state of emergency also operates domestically. This is a self-induced crisis brought about by its gun cult, the persistence of white supremacy, and its system of gross economic inequality. Nevertheless, in a country that prides itself on the rule of law, this politics of ‘exception’ continually opens up these micro spaces in which black life is reduced to bare life and no one need be held to account. These micro, temporary kill boxes that open up on US streets with a frightening regularity are, of course, the latest in a long history of violence against black people and appear within a social space already racially biased. Just like the enemy abroad, black people at home are seen as “pre-insurgent”, as if the fear of slave revolts still hangs heavy over US culture. Nearly all of the killings and the excuses for the killings carry this mark of the “pre-insurgent”. All the time we hear, “we thought he had a gun” or “we thought he was reaching for a gun”. From the position of white supremacy a person of colour is always about to be a threat. The Black Lives Matter Movement went viral after the acquittal of Trayvon Martin’s killer in 2013. The hashtag #BlackLivesMatter has since become an international sign for justice, and has demonstrated how important social media and the web are for organizing political resistance, in an age in which the logic of the exception and the state of emergency are becoming the new normal. It is beholden upon anyone with a concern for our fast dwindling democratic protections to support this movement.